Climbing and access information for this peak is found on pages 221 and 222. 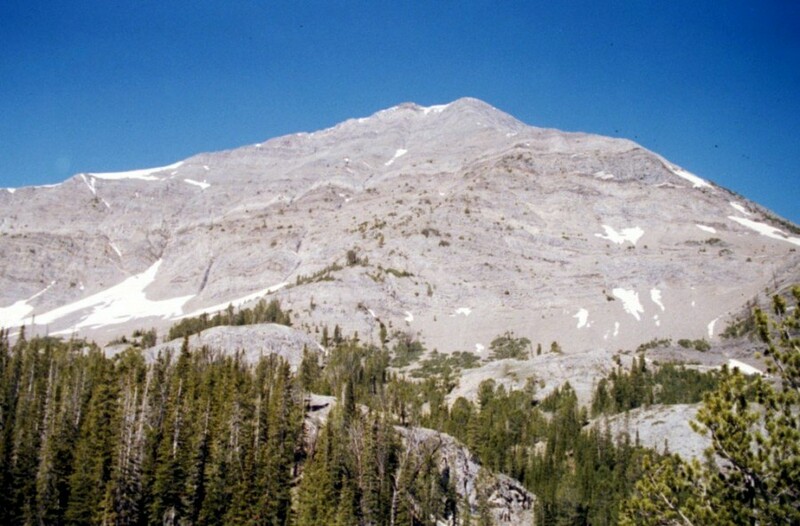 White Cloud Peak-7 (WCP-7) is one of 10 numbered peaks, denoted as “WCP-#” in the White Cloud Range. WCPs 1-10 are part of the Northern White Cloud Peak Group (page 220 of Idaho A Climbing Guide). All 10 are spectacular peaks! WCP-7 is located just west of Ocalkens Lake. 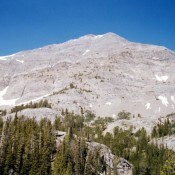 This peak is one of the easiest WCP peaks to access. The book details my route up the peak’s North Ridge and East Face. 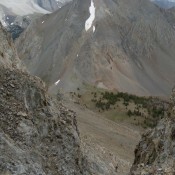 Below you will find Livingston Douglas’ route up the peak’s South Ridge. WCP-7 from WCP-5. John Platt Photo. I climbed this route on 8/31/16 starting with the North Ridge Route and Iron Basin Trail, (A)(2)(a.1.1.1) or (A)(5)(c). I took the Slate Creek side approach, (A)(5)(c). The Slate Creek Trail takes you to Ocalkens Lake. Here, pick up the Iron Basin Trail. This trail is unmarked and a little difficult to find, but it leads to Iron Basin Pass (and then down into Iron Basin). You basically ascend WCP-7 from Iron Basin Pass. 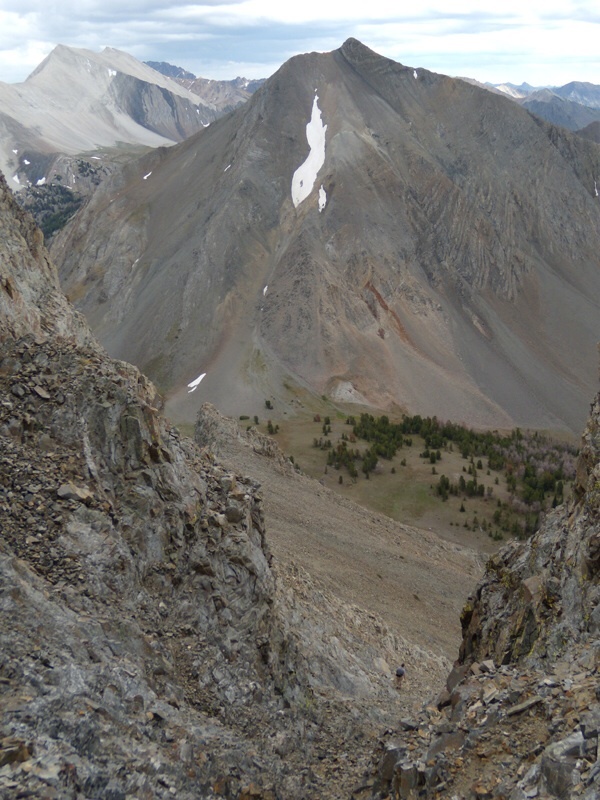 I descended the South Ridge of WCP-7 as part of a ridge traverse to WCP-8. Upon my return from WCP-8 (after diverting to climb Peak 10182, which is also known as Iron Basin Peak or White Cloud Pyramid), I climbed WCP-7’s South Ridge. 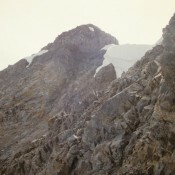 The South Ridge is mostly Class 2 with a bit of Class 3 near the summit. 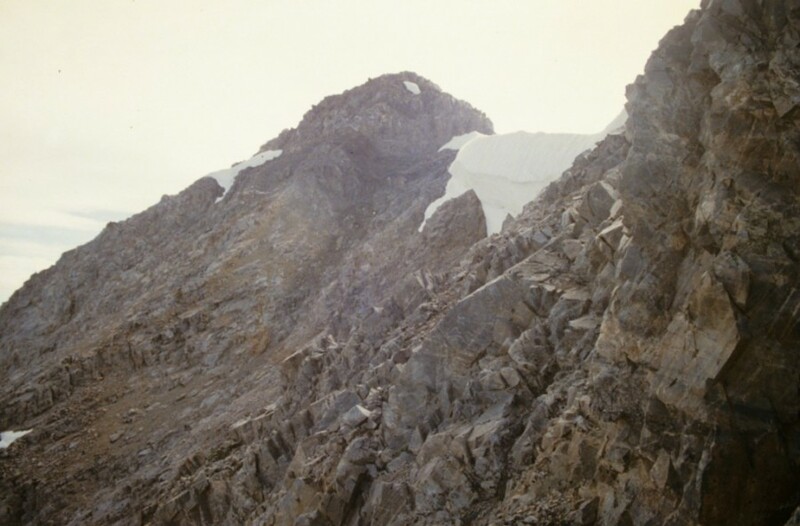 The terrain is a combination of talus and scree, and the exposure on the east side of the ridge is fierce at times. Avoid the exposure by staying on the ridge crest (which is not narrow) or just to the west of it. There are nice views of Ocalkens Lake and Bighorn Basin from this ridge.